And the Minions are the best thing on the poster too. Despicable Me never seems to aim for any lofty heights, but despite myself I enjoyed it in a very lightweight sort of way. 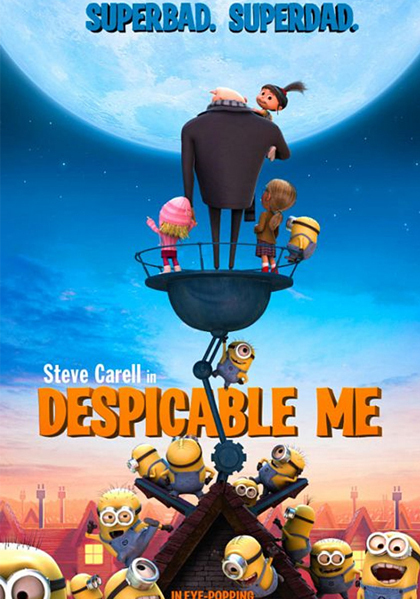 The film revolves around Gru (Steve Carrell), a character of (I think?) Eastern European origin, who looks like the Critic from Ratatouille – with an extra 40 kgs and an even pointier nose. Gru is a wannabe supervillain who desperately yearns for notoriety – only in this bold new era of younger and better equipped supervillains performing larger and more evil acts of villainy – it is becoming harder to stand out from the crowd. In fact Gru’s last several attempts at major crime have actually resulted in capital losses – something that has damaged his Credit Rating at the local Bank of Evil (I thought after 2008 that was the name for ALL banks?). Spot check. Yep, still funny. Gru doesn’t work alone however, he has an evil scientist sidekick named Dr Nefario (Russell Brand) who pops in and out of the story. Nefario is hard of hearing and a bit scatterbrained, but he keeps bringing Gru back to reality and devises new weapons and gadgets to aid his evil schemes. 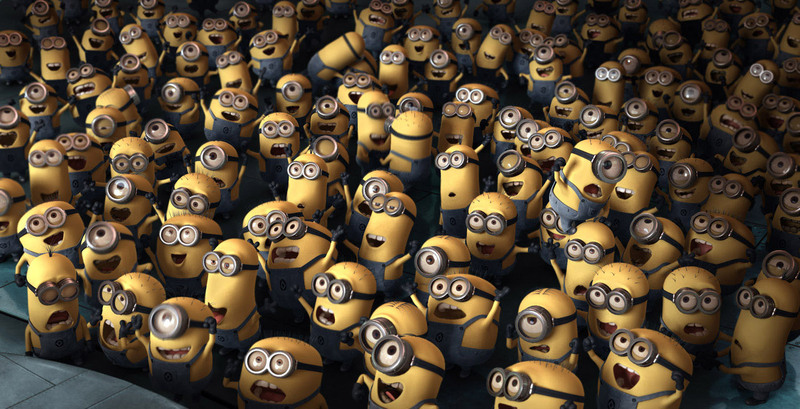 Gru also has many minions that all look like tennis-ball-coloured overall wearing Twinkies about 2 foot tall. Their number of eyes varies between one and two, and they speak a nonsensical (for the most part) language. 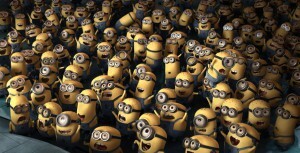 They seem perpetually happy and adore Gru and obey his every instruction implicitly. 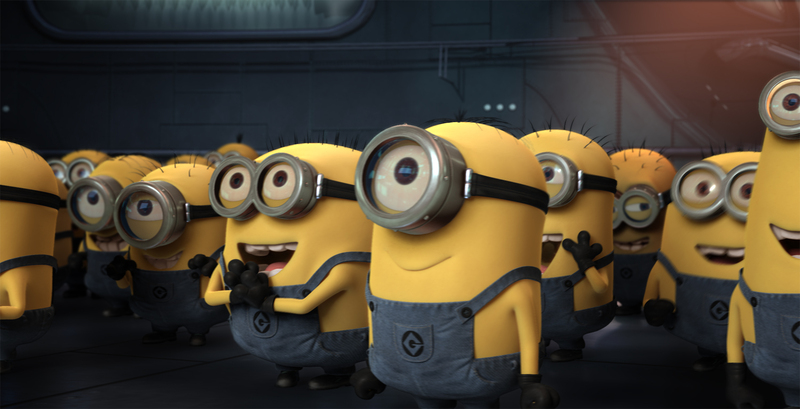 While the rest of the film provides a fair number of chuckles make no mistake, it is the minions that are far and away the funniest characters in Despicable Me. But what of the plot? Gru decides with the help of his fiendish scientist buddy Dr Nefario that their next project will merely be stealing the Moon itself – what they’ll then do with it is never discussed in any detail… The problem is to fund the scheme Gru needs money, and the Bank of Evil won’t give him money without proof that he has the shrink ray that everyone knows is required to complete the task. 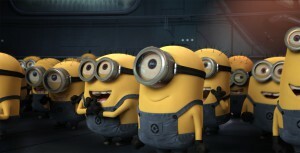 Upon spotting how easily a group of orphan cookie sellers gain entry Gru hatches a devious plot. I’ll fast forward through the next bit but suffice to say Gru decides to adopt these three adorable orphan girls Margo, Edith and Agnes (about 8, 5 and 3 ish respectively) and use them to gain entry. There is a subplot about how the orphanage is being run as something of a money-making sweat shop by a supposedly nice (but really evil) woman named Miss Hattie – but for some reason this is never explored much beyond establishing the premise. The kids are relieved at being out of the orphanage – and they love playing with the minions – the minions similarly love playing with the kids. Gru himself refuses point blank though to play, or really do anything relating to the kids… initially. If some are good, more must be better. Gru firmly believes that true supervillains can’t afford the emotional distraction of having a family, so in the early going he deliberately avoids any real contact or discussion with the girls, Dr Nefario in particular resents the girls presence and wants them gone. The voice acting is OK but lacks a WOW factor, Brand simply thickens his own accent and Carrell comes across as a “Gary Oldman as Dracula” clone, and Segal merely plays Vector as a cocky kid – which is what he is so go ahead Jason. The songs by Pharell are – to be frank – twee, simple and boring – though I think that was supposed to be a big deal as the film keeps showcasing these boring little ditties over montages and key scenes. But that was really the only true negative to a surprisingly funny and entertaining film. Even though Despicable Me is a totally lightweight and fluffy kid’s flick it manages to navigate a fine line between funny and cutesy, the girls are cute and adorable without being saccharine sweet and Gru and Nefario are more naughty than evil or diabolical. The ending to the film is quite well done actually which is a change nowadays when animated films simply stop once they run out of jokes rather than build to a big finale, but as mentioned before it is the Minions that steal the show. Like a funnier Scrat (from the Ice Age films) they bumble and dodder about the place with inane grins jabbering away, each time at least eliciting a smile. Repeat viewings might dull their impact and amusement level, but on first viewing I couldn’t help but chuckle at them frequently. Final Rating – 7 / 10. See it for the plot, stay for the Minions. If you must choose between Megamind and Despicable Me this year, this film wins by a country mile.